Strategy is harder to get into and more prestigious. The skills for strategy consulting is a super set of those needed for operations. Strategy consultants do work on operations as I do, but not vice versa. Operation consultants, particularly the senior ones, tend to have more functional or industry knowledge.Strategy consultants have more general problem solving skills. Operations consulting, also referred to as operations management, is defined as advisory and/or implementation services that improve an organisation's value chain. Operations management consulting projects create more effective client operations by advising on and supporting with the implementation of changes to the organisation, functional business processes, management systems, culture and other elements part of the value chain. 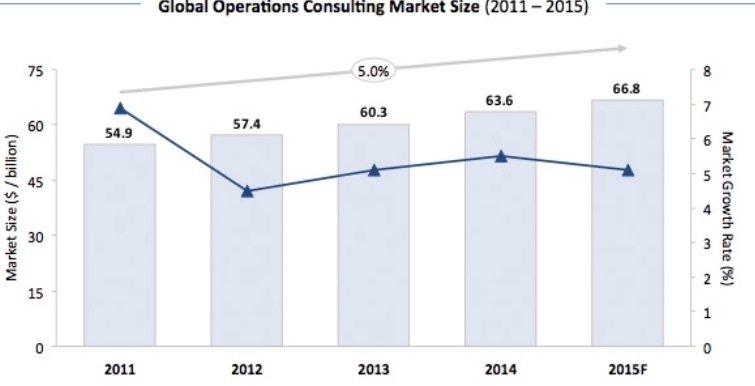 The market for operations consulting services is estimated to be worth $63.6 billion, making it the largest segment within the global consulting market, representing nearly 30% of the total. This year and next year the operations advisory market is forecasted to grow with more than 5% per annum, as a result the CAGR for the period 2011 - 2015 will amount to 5.0%. Specify the particular project(s) you need assistance with. If assistance is needed for multiple services, please list services below.